Yesterday Twitter announced that they are rolling out deeper personalisation in the algorithm that displays trending topics to each user. 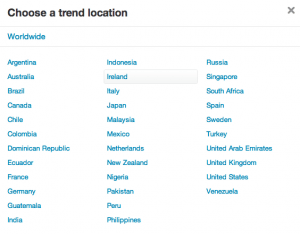 Last year Twitter moved from showing the top 10 trending topics globally to showing local country trends and now they are going one (well actually two) steps deeper. From this week, users will begin to see trends that are customised by City (in certain countries) and influenced by whom they follow. The former is nice but no huge deal, the latter is most definitely a big deal and here’s why. The latter strategy is often employed by spammers; in fact once you start being mentioned by a host of hot babes with X and Z in their name, you can guarantee that you’ve just tweeted on a trending topic! I would never advocate jumping on the bandwagon as the relevancy factor is poor. However, with personalised trending topics, there is now a huge opportunity to leverage trending topics that are more likely to be relevant to your followers and your expertise. Think about it. If your content strategy is all about engaging with developers, chances are that the people who follow you also follow similar people. Just run a follower cloud search on the average person’s followers and you can see very easily how often there is a match for related keywords in follower bios (Followerwonk can do this for free as long as the user has less than 1000 followers). If you’re being followed by people who follow the same people that you follow in the same location then your trends should be similar. If you want to reach a potentially large (yet niche) audience, tweet out some relevant content and start engaging in that conversation. I expect that Twitter will continue to tweak their Trends algorithm so that no one person sees the exact same list. This is powerful and is no doubt going to further improve the overall user experience. LinkedIn have attempted this with their LinkedIn Today product that produces a personalised newspaper based on your profession. The new Twitter Trends should go one step further. 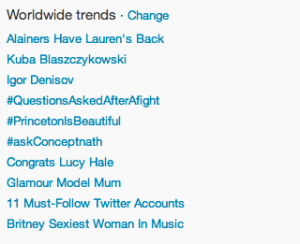 You choose whom to follow and Twitter shows you the top trends from those people. This is the power of big data on a micro level. 3. If you can further select by city or state, do that. 4. 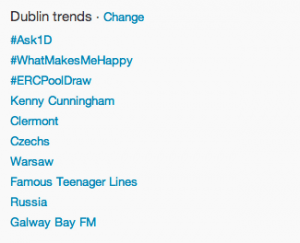 You are now seeing local, customised trends. How do you build followers and influence on Twitter? 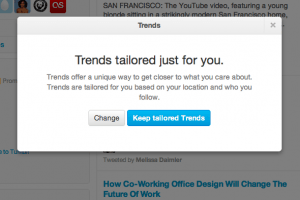 What do you think of the new Trends feature and how will you use it? If read this without saying YES ten times then are you really a salesperson? Wonder what skills, roles and seniority levels recruiters around the world are searching for right now?